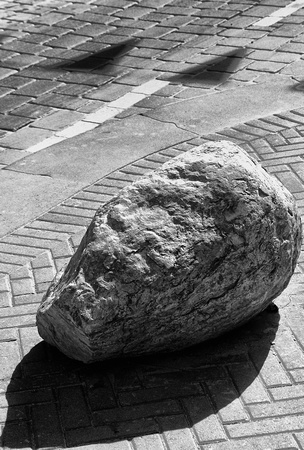 As a pedestrian on these streets, I was very hopeful that this rock, like Peter, would prevail against an errant vehicle if not the Gates of Hell. 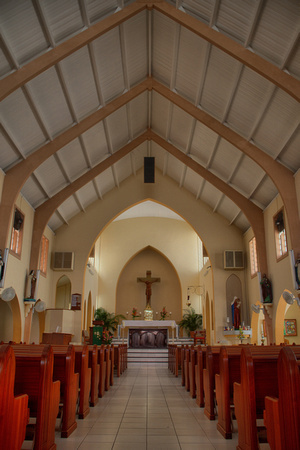 Farther down Front Street, Philipsburg, past the Jewelery Shops and Casinos, there lies the Roman Catholic church of Saint Martin of Tours, it extends from Front Street onto the Boardwalk facing the Great Bay. I have to assume that either the hurricanes don’t hit too hard here or this church was built to prevail. I took the opportunity to take some multiple exposures with the intent to try an HDR image. The pews are stained a deep reddish wood colour and this is very evident in the photograph. The few people who go to pray during the day must be accustomed to crazy tourists snapping photographs since it didn’t seem to bother them as I took my time getting this shot, of course, I tried to be as unobtrusive as possible, but that quite hard for a man of Chinese descent with a rather large camera in hand. This HDR is a composite of three exposures, 0ev, +2ev and -2ev, I still have some issues with alignment, but I think I am getting the hang of it. I think you have saved some of the best for last. Quite often the subtly good shots require some amount of contemplation before you can realise their goodness. I strongly recommend you give it a month or so and then go back through your photos to see what gems you might have missed. Love the composite of the church. Wow! So, what are the triangles in the upper left corner of the “rock” shot? Are those shadows of something? So lovely. This I like very much, the church, I mean.